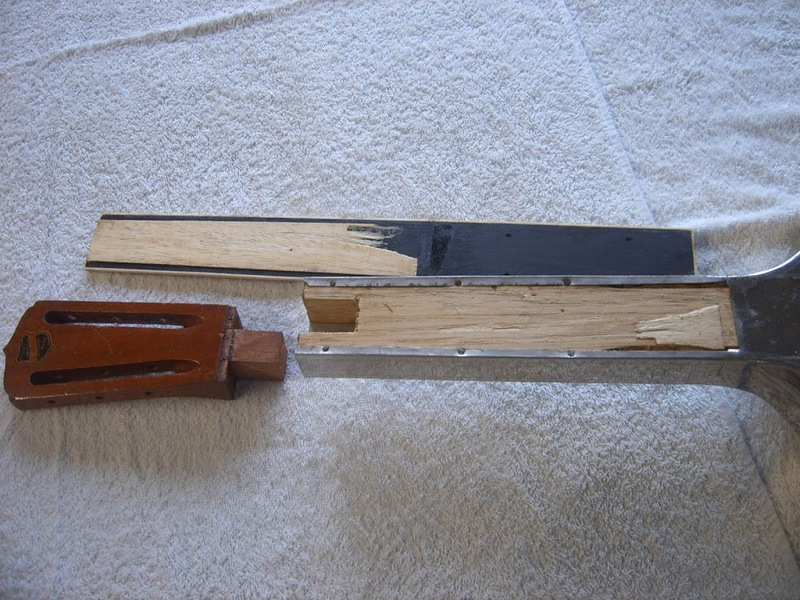 National Square Neck Guitars often develop problems with the joint between the wooden headstock and the metal body. The simple mortise joint into a pine block inside the neck is held by animal glue. This glue crystalizes over the years and any joint like this that takes a lot of tension is bound to give way. 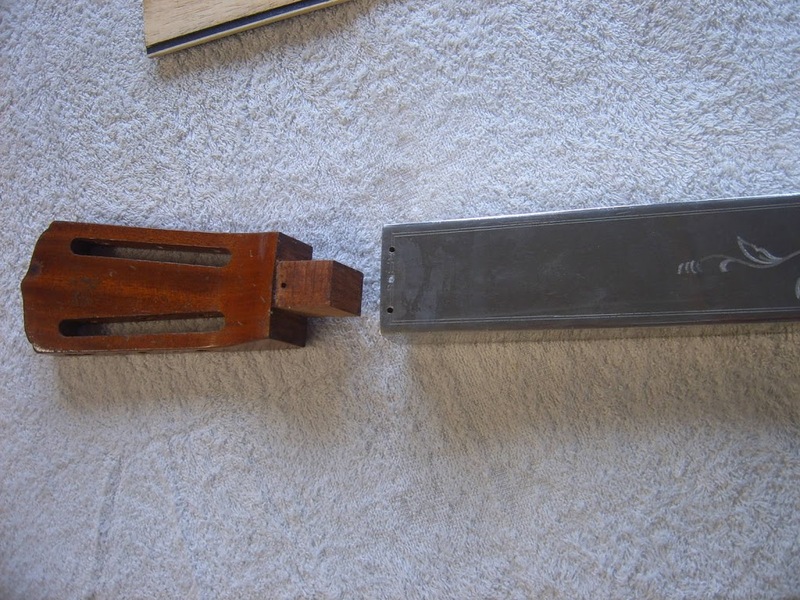 At some stage someone has drilled through the metal neck from behind and inserted screws(3) . This isn’t enough to hold it once the glue has gone. 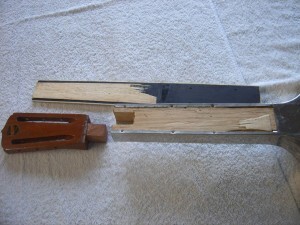 After removing the fingerboard the photo below shows what is revealed. Far from being hollow , the neck has a pine block inserted from the nut to the 10th fret. The sides wrap around this and their edges are nailed in the block. The is no metal on the front side of the neck as you can see below. When the glue is cleaned off the wooden surfaces they are still a reasonable fit so all that is needed is some 2 part Epoxy glue. This is also good at filling any gaps in the recess. You can see the 3 screw holes in the back of the neck in this photo. The dismantled tricone. The fingerboard is glued to a small fillet of wood to provide a rebate for the overlapping edges from the nut to the 10th fret. I added a couple of screws under the pearl dots for extra strength. The rest of the fingerboard over the body is held by the traditional National bolt under the pearl dots that pass through the body and a wooden pad and into a nut under the wood.You can see the block bottom left of this photo with it’s felt covering to keep down the rattles. 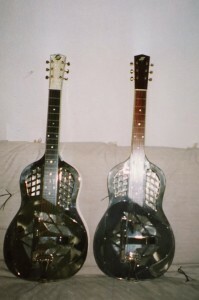 Back in the 1990s Bill Johnson and I made some square neck Beltona Tricones.Bill made the body with a complete square section neck ie it had a front metal surface too. These were very rigid and unlike some of the old ones there was no bending along the neck. It also meant we could put a much smaller block in the neck to take the headstock. 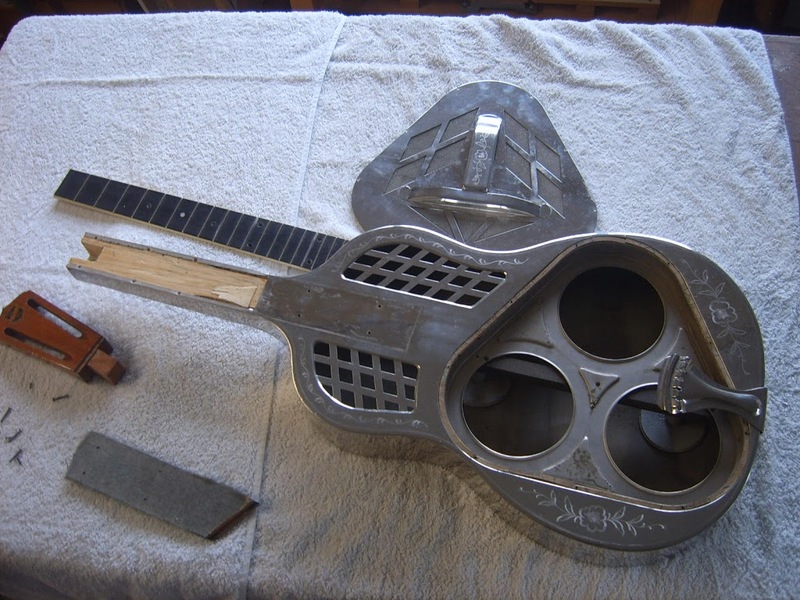 This left more of the body hollow , all the way up to the 4th fret.. I also drilled out a honeycomb of holes in the block to further reduce the weight. The mortise also had a ramped face that worked against the headstock ever pulling forward. 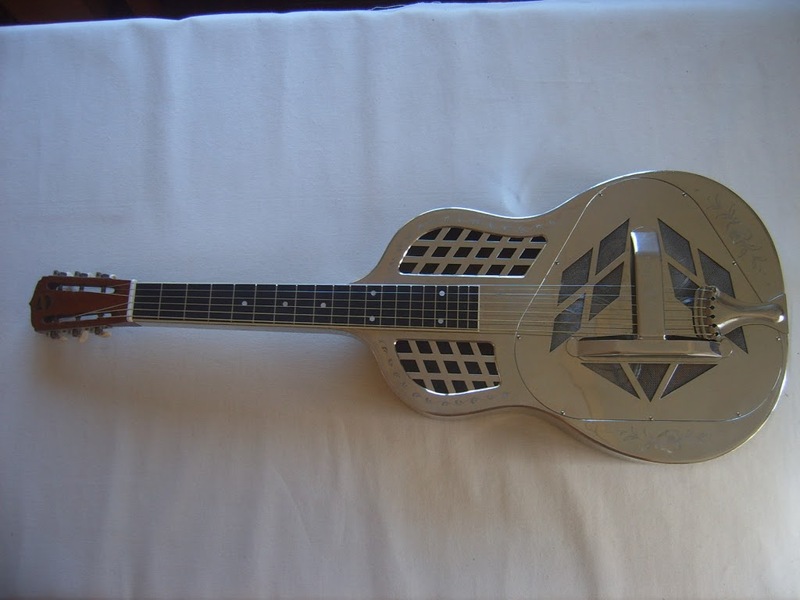 I think this was an improvement in the construction of these wonderful guitars that changed the world of steel playing back in the late twenties before the Tsunami of electrification. Above is a very poor scan of a photograph of two Beltona Square neck tricones built in the 1990’s. A tribute to Bill Johnson’s metal working skills.